Sunday’s Ben Stevens Memorial Cup clash between East Campbelltown Eagles and Wentworthville Magpies at Waminda Oval was a lot more than just a game of footy. Sure, the Eagles displayed their trademark resilience in the second half to put the Magpies away 34-16, but it took a very good pep talk from coach Richard Barnes at the break to ignite the boys from Campbelltown. The result kept the large crowd happy, but as club president Daniel Draper said afterwards the day was as much about mental health foundation Headspace as it was about winning on the field. The day commemorated the life of the late Ben Stevens, who played for the Eagles at the time of his unfortunate death. “This week was Headspace week, which coincided with our Ben Stevens Round,’’ Mr Draper said. “Our club had a Headspace workshop for all our players from under 12 all the way up to our Sydney Shield. Eagles coach Richard Barnes talking to his players at half time. 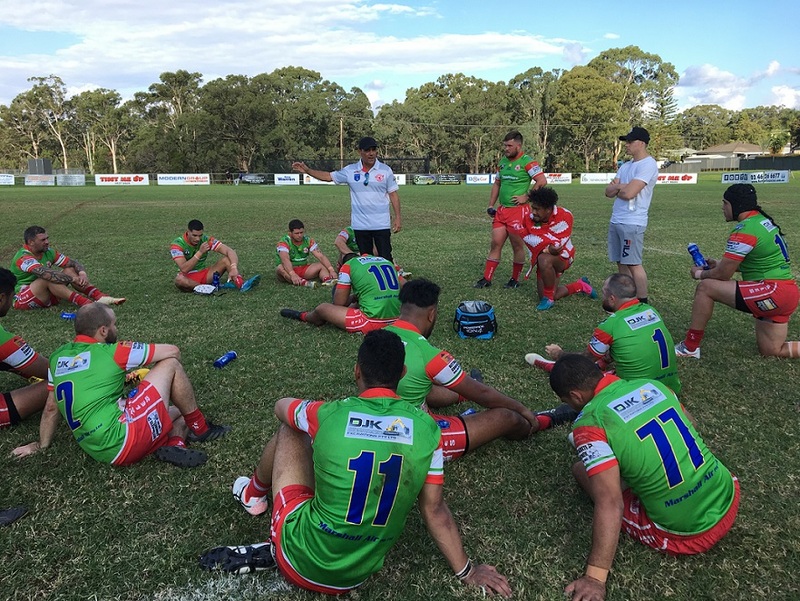 Back on the field, the 2018 Sydney Shield premiers were chasing five wins from five starts in 2019 when they ran out to face the Magpies on a glorious Sunday afternoon in east Campbelltown. The two teams traded early tries to be locked up at 6-6 before both settled down to a good old fashioned arm wrestle. It all looked more or less even even but some lazy tackling from the home side allowed the Magpies to go to the break leading 16-12. Eagles coach Richard Barnes kept his boys out in the middle of the field while he lambasted them for their poor attitude and called on them to get back into the grind. The Barnes sermon must have worked wonders because the Eagles lifted in the second half and it didn’t take them long to score not one but two tries to go to a 22-16 lead and looking menacing for the first time in the match. The Eagles score their second try in the first stanza. Another try was scored soon after for the Eagles to be 26-16 – and to have the visitors shellshocked by the change in the attitude of the home side. A penalty goal followed by another converted try and the Eagles had landed at 34-16. Wenty did not score a single point in the second half – no wonder coach Barnes was full of praise after the 80 minutes. “It was very pleasing to see the guys turn the game around at half time,’’ he said. “Wenty had us under the pump in the first half; our completions were bad at under 50 percent. “But our guys got back into the grind and our second half was an excellent result. Best for the Eagles were Shannon Gallant, Aaron Teariki while Grant Lahey received the players’ player and Tom Morrison man of the match. The Eagles will enjoy the bye round during Easter this weekend before taking on Cabramatta at Waminda Oval on Sunday, April 28. Under 23: Eagles 12 Hills Bulls 20.